BIG AND BEAUTIFUL: Sunita Tamang holds up the design of the mosaic, while school children in Suryodaya School in Butwal last week put finishing touches on the art work that hopes to raise awareness about the dangers of trafficking. In the middle of the Tinau River that separates the two sections of Butwal, the river itself bifurcates. The island is a slum area called Majhuwa, which means ‘middle’. There was a shantytown here that was washed away in a great flood 15 years ago in which hundreds were killed, but a year later the squatters were back. 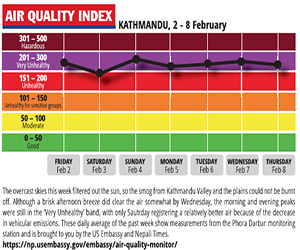 As is the case elsewhere, it is the poorest of the poor who live in such a vulnerable spot. But the families here are not just susceptible to natural disasters, Majhuwa is also a hotbed for child traffickers. In the midst of all this squalour is the neat little Suryodaya Primary School. 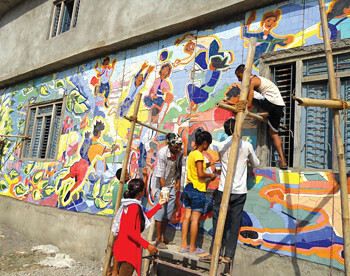 Students here have been busy for the past month, creating what is probably Nepal’s biggest mural on their school wall. The artists are hearing impaired, handicapped children as well as children rescued from the clutches of traffickers who had taken them to work as slaves in circuses in India. The group cooperated with the UK-based charity, Freedom Matters, which has been rescuing and rehabilitating children trafficked to India, mainly to dance and perform in circuses. It also teaches them skills so they can be financially independent when they grow up. “We hope the mural will inspire students to have fun in school, work and study together, and to raise awareness about the dangers of being trafficked in an area where selling children is rife,” says Abha Karki of the group, Sano Paila. The mosaic is made up of pieces of coloured marble and tiles and consists of 21 panels that measure a total of 18.2m long and 3m high. Instructing the children is Sunita Tamang (pic, right) who is implementing a design created by British artist which depicts greenery, children having fun in school, the village becoming prosperous, and visual elements that warn of the dangers of trafficking. “In the beginning it was very difficult to communicate with the hearing-impaired children, but working on this mural has brought us together and we understand each other very well,” says Tamang. The parents of most of the school children in Majhuwa are away working in India or the Gulf and besides the mural, Freedom Matters supports the school academically. The young students, who have seen the mural being gradually completed, often stand around looking at the colourful images and putting together their own stories. With Sano Paila, Freedom Matters takes an arts-based focus to its anti-trafficking and rehabilitation work among marginalised and vulnerable children. The organisation also works in vocational training in social circus and silver jewelry to raise income.